Opening the Second Avenue Subway, Phase 1, will improve transit for Roosevelt Islanders, but to no one's surprise, we will have to wait a little longer than expected. In so many words, none of them very direct, the MTA has made it as clear as it makes anything that the Second Avenue Subway will not be ready to roll for its promised December opening. "We're going to keep the pressure on for the appropriate reasons by Dec. 31, but there isn't a person in the MTACC or on the operations side of the house that wants to rush it when it's not not there." I'll interpret: The Second Avenue Subway will not open on time. Problems foreshadowed the delay in reports going back to last spring. But really, the situation did not seem dire. The only difficulty, MTA engineers explained, was that they weren't getting enough testing done. Testing on a broad range of systems was being completed at only about half the rate needed to meet deadlines for the December opening. Easy, right? Do more tests! Hold on there, cowboy. This was government speak. Peal back a layer. Tests weren't any part of the problem. Hiding behind the euphemistic "tests" lurked the reality that they weren't being completed because systems and infrastructure work was so far behind that there wasn't enough ready to test. 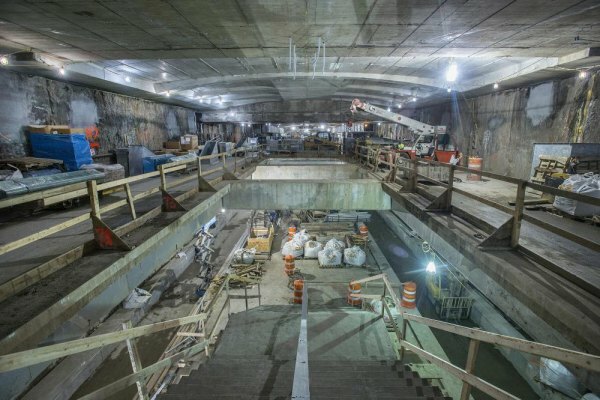 Only nine years after the $4.17 billion project launched, elevators for the 72nd Street Station had not been delivered as of June. Today, neither the elevators nor escalators at the station are finished, complications making it impossible to link them into the fire alarm system. Therefore, tests still can't be run. The 86th Street Station also has problems but is farther along. You can do the math. This phase of construction involves the creation of only four stations. It's three years late already, and only half its stations are going to be ready for a December opening. Incomplete tests are not the reason. Unless your optimism is so great it makes Pollyanna look like a cynic, you already take for granted that major government projects always take longer and cost more than the official estimates used to get them approved. The Second Avenue Subway is no exception. If you're really hard-nosed about it, you might mention that the Second Avenue Line is nearly a century late, having been proposed as part of an IND System expansion in 1919. Others are willing to accept three years after the line's more recent promised completion in 2013 as about what a rational person should expect. Three years and, now, at least one month. Using the MTA's preferred lingo, tests were still not being completed at half the necessary rate as of the September Board meeting, which honestly makes January look more hopeful than real. But on the upside, as riders noticed, out of service B and G trains were running on the tracks from 57th Street through the 63rd Street Station recently. The trains were weighted to imitate passenger loads. What these tests signal is that a charge of electricity powerful enough to run trains is now enlivening the crucial the third rail. Nothing could be more significant for practical purposes. In fact, the MTA is capable of sending passengers on Q Trains up Second Avenue today, if they were foolish enough to expedite the opening. But without a thorough testing of safety systems, that's not going to happen fortunately, and with stations still not finished enough to permit final testing, we can't be sure when it will be. In fairness, the Second Avenue Subway is a massive undertaking. On the other hand, Phase One is only a small part of the full system, it's taken three years longer than promised and nothing about it inspires confidence that the whole thing will be done by 2029, its projected completion date. *The Daily thanks reader Sylvan Klein for a tip leading to this story.